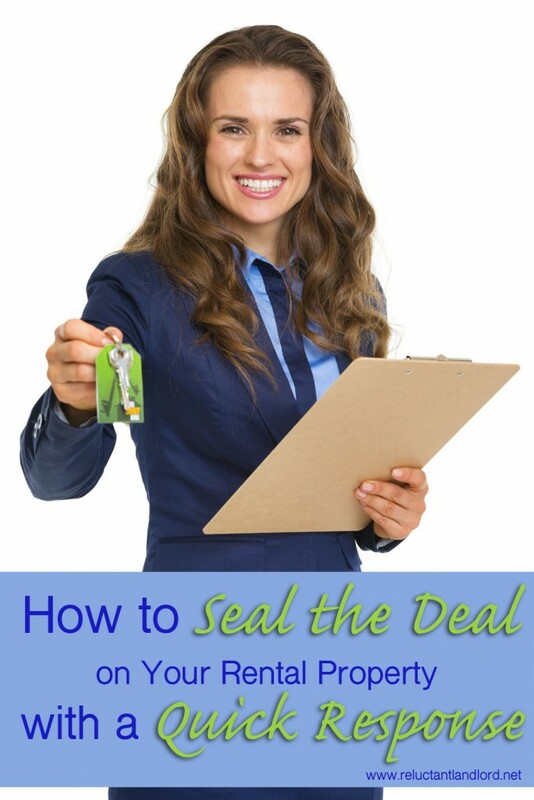 Are you a landlord looking to seal the deal? My biggest tip is to have a quick response rate. Rental management is a race against time. Every missed call or unanswered email is a missed opportunity. The rental industry is a very quick market segment with new supply and demand coming on the market all the time. Most renters need a place and landlords need a tenant within a defined length of time. While both have criteria and expectations, they tend to shop until they find the right fit. As soon as they find the right fit, they stop looking. This phenomenon illustrates the need for calls and emails to be answered and showings to be scheduled. A quick response is vital. I cannot tell you the number of times that scheduling appointments 3-5 days out (scheduling on Mon. for a Sat./Sun.) has culminated in no-shows or call-backs saying they found another place. While not always possible, I have had the most luck scheduling the showings ASAP. I have been known to show houses on the same day, sometimes with just a few minutes of notice. Two of my houses rented from showings where I dropped everything to immediately show the house. In 85% of the cases, I have found that applicants decide to proceed further on the spot. In my experience most people don’t continue looking at other places only to come back to my house. On the other hand, the couple of times I have been slow to process applicants, I have had them continue to look at houses. One almost walked away because I didn’t have a quick response. I lost another applicant because I wasn’t fast enough in getting everything complete. Be Available to Show the House – Having my homes open and available for showings during the advertising period is a huge reason for my success. This is the reason I don’t have vacant homes for very long. The house that has been one of the longest to fill was delayed because the house was not available to circumstances out of my control. I can tell you that of the two people scheduled to see the house eight days later — both were no-shows! You can accomplish prompt showings easily. Have your current tenant show the property to prospective tenants. Include this language in your lease. Be Prepared – Have the application and lease ready to go. I personally use a blank lease. This allows it to always be ready. It is so important to have a quick response — keep answering the phone, schedule showings as soon as possible (cuts down on no-shows), and keep plodding forth. None of my rentals have lost a day in rent, although they have definitely given me some ulcer-inducing moments. Do you normally have a quick response? What has been your experience?